After reading multiple Curious George books to my daughter, I knew she would like the pictures in Curious George’s Opposites by H.A. Rey. The front cover of the book shows two drawings of George on a blue and yellow beach ball against a green background. Like all illustrations of the cute monkey, George has a smile on his face as he stands on the ball in the picture on the left and does a handstand on top of the ball in the picture on the right. The premise of Curious George’s Opposites is to teach children about the concept of opposite. The first page shows George climbing up a wall while the second page shows George jumping down. The words “up” and “down” are capitalized and in red font to attract little readers attention. Similar pairs of opposites are displayed in the same font style throughout the rest of the book. The text introduces six distinct pairs of words, but more importantly, it allows children to focus on the idea of looking for opposites. Coupled with an emphasis on identifying other opposites in the real world, Curious George’s Opposites can serve as a great teaching tool for young children just learning how to talk. For young babies like Arya the book is more useful for its cute illustrations and quick pace. My daughter enjoys looking at all Curious George books because of the consistently high quality of illustrations. 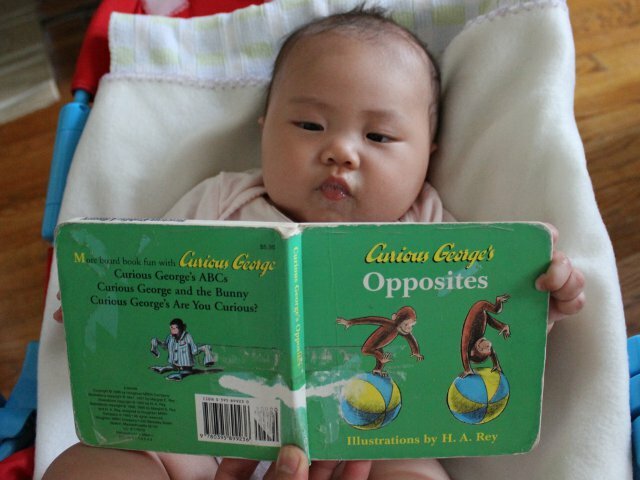 So while Opposites is best focused at children who are old enough to learn new words focused around the theme of opposites, even young babies will enjoy looking at the cute pictures and quickly flipping through the book with its short text. Curious George’s Opposites costs (including shipping) $5.95 new and $3.20 used from Amazon.